Last month, we discussed ongoing and emerging trends in sales, compliance and recalls that will affect the way dealers do business in 2016. For Part Two of our two-part series, we will turn our focus to technology and data, mergers and acquisitions, and personnel. Each will affect your operation, for better or worse, in the year ahead and beyond. So let’s get started. The challenges of purchasing technology and effectively deploying its functionality in the dealership have only grown with the preponderance of new solutions, and there is no end in sight. I have long advocated that dealerships define their business processes and develop requirements where technology may enable and create efficiencies and provide measured results. In 2016, you will have more options than ever to support all functions of your stores. Over the last year, we have seen consolidation and enhancement of services provided by both the large DMS players and many new and emerging disruptive solutions coming into the market from other industries and very bright, well-financed startups. Our OEM, distributor and dealer group clients have been overwhelmed by the sheer volume of new solutions. In response, my company created “Test Track,” a process designed to provide due diligence and vetting of many solutions coming to market. We found that fewer than 20% of these solutions are highly disruptive against current solutions on the market and will challenge many of the larger DMS and other dealership service providers for market share. Many of these firms will also be absorbed by these larger players. So expect further consolidation and attrition of those vendors that are unable to deliver, lack a support network or are undercapitalized. For further evidence, look no further than moves made by large investors, such as media companies, venture capital and private equity firms in our industry. Examples include CDK breaking out of ADP, Cox Automotive’s acquisition of Dealertrack, Gannett’s acquisition of Cars.com, and Autobytel’s acquisitions of AutoWeb and Dealix. Consolidation gives dealers and auto groups a choice between a one-stop shop and selecting best-in-class solutions from multiple providers. While the large dealer groups have consistently moved to single-vendor DMS platforms, they are more apt to review multiple solutions that most closely address their business requirements. Most of these are web- or mobile-based services housed on what is known as a software as a service (SAAS) platform, and all are expected to deliver the type of sales process that will appeal to Millennial car buyers. As dealers seek to integrate multiple solutions, the movement of sensitive and proprietary customer and dealership data is essential. Remember that liability for the protection of personally identifiable data, much of which is shared with third-party lead providers and other vendors, ultimately falls on the dealership. The National Automobile Dealers Association (NADA) has published guidelines for dealers pertaining to the management of data movement. The guidance makes clear that dealers must know where, when, how and why their data is in transit. If you have not taken inventory of who has access to your data, I recommend that you do so immediately. The leading DMS providers have provided certification programs for third-party vendors. They would contend that vendors must be certified to securely access your data. But you must also be sure that any data you share with a third party is “pushed” from the DMS, as there is no benefit to allowing vendors to access and mine your DMS for valuable — and, in some cases, unauthorized — data. Certification isn’t free, so expect to see some increase in pricing for related services. Many of the applications utilized in the dealership are password-protected. So it is not unusual for employees to juggle multiple logins and passwords, nor is it unusual for them to maintain access when they leave your company. Make access removal part of your exit process for all employees. There is an application offered by Dealer HQ that will inventory, consolidate, manage and monitor all access and application activity. It’s a simple solution that can help reduce your liability. Finally, be sure that you are managing hard files in a secure manner in your dealership. Know where data is stored, the level of liability coverage your vendors are providing to protect against breach, and who within your dealership has access to each type of data. In a recent visit to a dealership, I saw deal jackets lying around in an open office with credit applications, signed contracts and even personal checks paper-clipped to deals that had yet to be billed. A walk around your dealership may be eye-opening. It would be difficult to look back on 2015 without some mention of the merger and acquisition activity in the retail space. With transactions approaching recent highs, new investors are coming into the market. Some are driving up multiples for well-run dealerships representing good brands in desirable locations. Not all deals are bringing the multiples you have read about, however. With Berkshire Hathaway’s acquisition of Van Tuyl, Bechtel buying a large group in the Midwest, and Soros Management’s recent acquisition of McLarty Automotive, it is abundantly clear that there is a lot of capital available as well as interest in and awareness of the potential for dealerships that are consolidated in order to drive efficiencies while scaling in regional platforms. At the time of this article’s publication, there are many other transactions potentially coming together. They are being fueled by both private equity from outside the industry and larger retail groups looking to expand. In October 2014, Auto Data Processing Inc. completed its spinoff of its former Dealer Services business, which now operates as CDK Global Inc. The technology firm is one of the dominant providers of dealer operating software. It also provides digital marketing services through its Cobalt unit. This may be a good time to take a hard look at your succession plan. If you don’t have one, take steps to put one in place. While many dealers have insurance and family trusts established to deal with tax liabilities stemming from an untimely death or a divorce, few have developed a business continuation plan of substance. While manufacturers have required you to name a successor, today they require approval of that beneficiary. You must also complete a transition plan to ensure that your business continues to operate at a high level prior to any such transition. This may also be a good time to have your financial house in order should you be contemplating selling. The importance is not just in having a valuation, but making sure that you have “reconditioned” your dealership. This process is much like staging a home for sale. You need relevant qualification data about your management team, and to document competitive processes and positive growth. I would advise both a financial and operational audit of your stores. Even if you do not sell, it’s always good to be prepared. At the very least, you’ll uncover some opportunities to streamline your current operations. If you have a closely related business comingled with your dealership, be sure it is separated prior to any valuation or due diligence. If you are not paying yourself, or if you are undercharging rent or not following the OEM chart of accounts, I suggest getting those in order as well. As you prepare for 2016 and beyond, consider the impact of the current economic environment, especially the impact of rising interest rates for your dealership. On Dec. 16, the Federal Reserve Board increased the federal target interest rate by a quarter of a percent. While small, this change in monetary policy will have a direct impact on your dealership’s financial results. Higher interest rates will affect retail lending rates as well as real estate financing, floorplanning and operating capital loans, further impacting cash flow. When you review your overall performance in detail, your current and long-term notes, liquidity and large operating expense items, such as personnel, will be factors. These increased costs will impact your ability to leverage assets as tightening occurs. Understanding what your balance sheet is telling you will help you develop multiple scenarios based on your current funded and unfunded liabilities. A recent discussion with a well-known CEO of a large OEM revealed that his biggest obstacle to growth will be the ability to find and develop high-caliber dealer candidates to support growth in the market. At the franchise level, we have all been challenged to fill many tech positions, not to mention openings in sales, F&I and service. We must also face the fact that, in a declining unemployment scenario, younger workers may not be as attracted to the business as we were when we entered it many years ago. The NADA’s most recent Workforce Study reveals that, while dealership wages have moderately increased, turnover has remained high, especially compared to other industries. Variable operations turnover is currently tracking at 72%. This presents a heavy cost burden on the dealership to replace, train and retain staff. And it’s not just about compensation — the study also indicated that employees in dealerships actually earn 29% more than other employees in the private sector. This issue is really centered on employee engagement. In October 2014, the eyes and ears of high-stakes investors around the world turned to the U.S. automotive retail industry when billionaire Warren Buffet and his investment firm, Berkshire Hathaway, agreed to purchase the Van Tuyl Group in a multibillion-dollar deal. 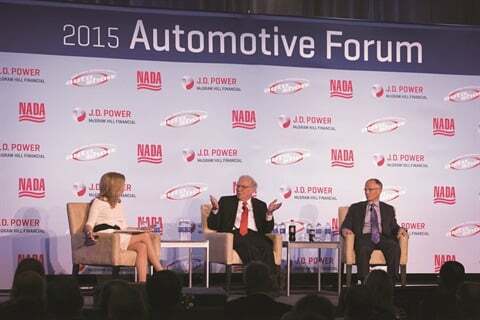 Last March, Buffet headlined the 2015 NADA/J.D. Power Automotive Forum when he took part in a special Q&A session. Paul Herr, author of “Primal Management,” refers to his book as an owner’s manual for operating employees. His focus is on the emotional engagement of employees — how they feel about the people they work with and for, the culture of the company and the perceived future of the organization. Herr has worked with companies ranging from manufacturing, finance, consumer products and retail. He has identified that, through changes in how management understands — not manages — their people, companies have been able to improve employee engagement as measured by his Horsepower Survey, a simple barometer that captures how staff “feels” periodically about their work. Employees often feel disengaged if they are not confident and clear on what is expected or if they lack the knowledge and tools required to do their work. Traditionally, training has been the answer, but training has not always been a true priority. Simply giving a new hire some product manuals and videos and occasional coaching by managers is not employee development. Dealers who put a premium on merging skills with culture, values and a career path know they are essential to retention. Companies like Axonify, a software company that leverages “brain science” in how people learn, has focused on delivery of information in repeated, bite-size pieces. They are able to measure the level of confidence and mastery of key skills, easily reinforcing knowledge in each individual of a company. They recently assisted Toyota Motor Sales in improving the level of knowledge of their sales consultants in the dealership by engaging through gamification and peer competition. Toyota realized that customers were more knowledgeable of the product than sales consultants in the dealership. They are expanding this learning method into fixed operations for all dealerships, which will provide a competitive advantage for their network. Ford’s Customer Experience Movement, which uses a different methodology, is being directed at dealers who wish to voluntarily participate. Ford is taking this initiative global, and the curriculum is not limited to product knowledge. The OEM wants sales pros to be able to intelligently interact with customers at all moments of truth. A key driver of this initiative is the development of management as a support mechanism for employee success. The role of the dealership management team is changing. Traditionally, we promoted the people who sold the most and were strong closers. However, many often are not trained on how to properly manage and coach others on a daily basis. The traditional sales path was a series of promotions from salesperson to the executive team. It was the same in fixed operations. As president of a large dealer group, I learned that, as we expanded, we needed to instill our culture in our managers for the future. I discovered that many salespeople were really interested in becoming career salespeople. We were also losing salespeople that would opt for a management position at another dealership because they thought they weren’t moving up the career ladder fast enough. We designed a management development curriculum and created a set of criteria for admission. Course content covered all hard and soft skills required to become a successful manager. We found that many of the salespeople who entered the program decided the management role was not for them once they really learned what was necessary to do that job. They would self-select to remain in a career position in sales, service or general administration of the dealership, many finishing their careers and retiring from the dealership with a nice profit-sharing and retirement plan. We see many corporate initiatives dedicated to perfecting the work-life balance. Ultimately, that is often something the employee must define. As we move forward, Millennial staff will desire a different work environment than the one we grew up in. Prior to getting all wound up in a major initiative, take a hard look at your current dealership culture and realistically document opportunities and barriers to succeed at your store. Who has ownership of this? The obvious answer is the dealer principal; however, your managers — especially those in remote stores — must share your vision. Have you developed learning tracks for your employees and managers? Do you have a budget for learning and development? Dealers who are able to effectively address the issues previously mentioned have experienced significantly lower turnover. I have reviewed dealerships that have annual turnover of less than 15%, and they generally perform at more than two or three times the national average for return on sales. They are also tracking return on gross above 30%, some above 40%. I think those financial results justify spending some time on your human capital investment. I hope that you are able to better understand where your dealership may be headed in the coming year and beyond. I am also interested in learning more about the issues you plan to prioritize for your stores in 2016. Please feel free to email me. I am always eager to hear about new and innovative practices that creative dealers are working on.